Last week I introduced a group of middle schoolers to some of the robotics and electronics kits that we’ll be testing out in the Robot Test Kitchen. 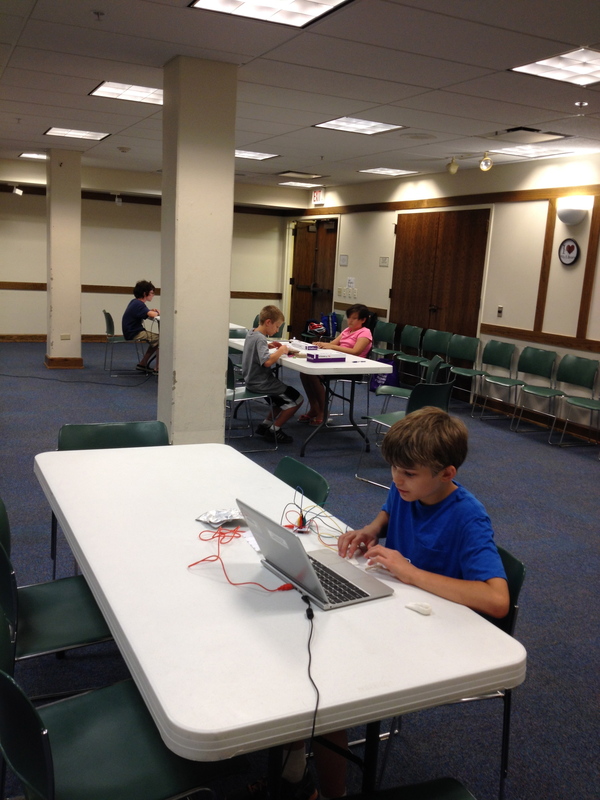 I had four attend (which is a typical size for teen summer programs in my library) and then four tweens came later. I set up the meeting room with a different activity at each table. I introduced each of the gadgets and did a quick demo. When I let the teens loose, one thing was constant regardless of who was using what: no one even looked at the instructions – they much preferred to experiment and learn by doing. Even when I suggested that they might find some ideas or answers in the instructions, they were hesitant to open the booklets! “Where imaginations play, learning happens,” is one of the core principals of this project, so after the demos, I sat back and let the group explore and play… and learn. 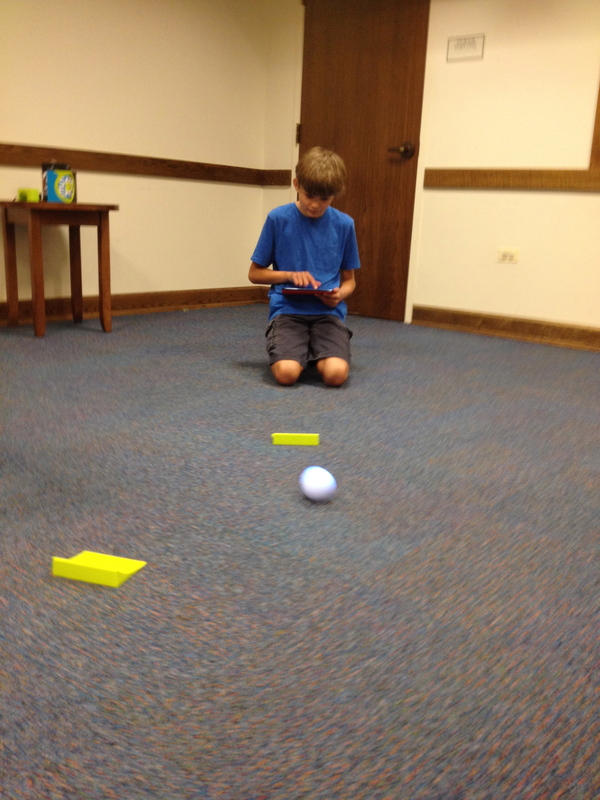 Sphero was the biggest hit with the most people, but is really a one-person activity unless teens are working together to build macros or do other, more advanced programming. It was so much fun though, and everyone enjoyed it and the variety of apps that were available to play with. I’d have to say that MaKey MaKey came in second for the “wow” factor. I didn’t bring in the variety of conductive stuff that I had would have if the full program was about it, but even with the few items that I had, the teens quickly figured it out and had fun playing Super Mario Brothers with Model Magic clay, the chairs they were sitting on, and pencil drawings. 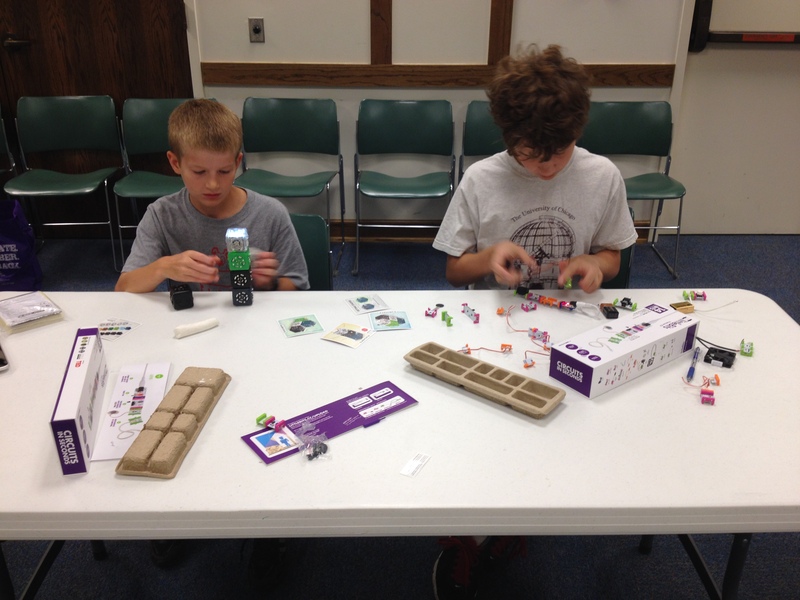 We purchased a Student Set of littleBits, which includes 26 modules. This was enough for two people to comfortably work together, or on their own projects exclusively with the Bits. One teen spent most of the two hour block constructing an elaborate, Rube Goldberg-esque contraption to turn a light on, involving most of the bits. I didn’t provide any additional material for creating the projects outlined in the instructions, but since no one read the instructions anyway, they didn’t seem to miss anything! BeeBot is really designed with younger kids in mind, but mine had a fun enough time driving it around for a few minutes. On the other end of the spectrum, the Finch requires a lot more time and patience to start learning, and as a result, in this setting, it garnered their attention for just about as long as the Bee Bot did. In the future, I do think the Finch will be one of my preferred tools for working with this age group as it offers a lot of possibilities for expansion and building a whole program around this one, affordable device. Cubelets are so easy to snap together into different configurations, test, change, and try again, that they were another highly played with device. I don’t see the basic set of six being something that would hold the interest of teens for a very long time though, without additional cubes or specific program goals in mind. The biggest fun came when the teens constructed the “Fraidy Bot” described in the included cards. This is a robot that runs away when it detects that anything is behind it. 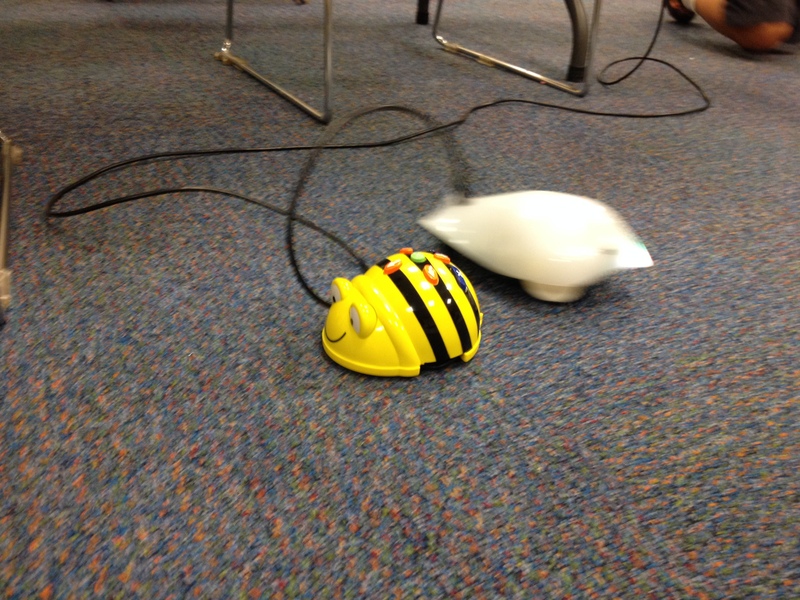 They liked antagonizing the Fraidy Bot with Sphero, driving Sphero in circles around the Fraidy Bot. Poor robot! 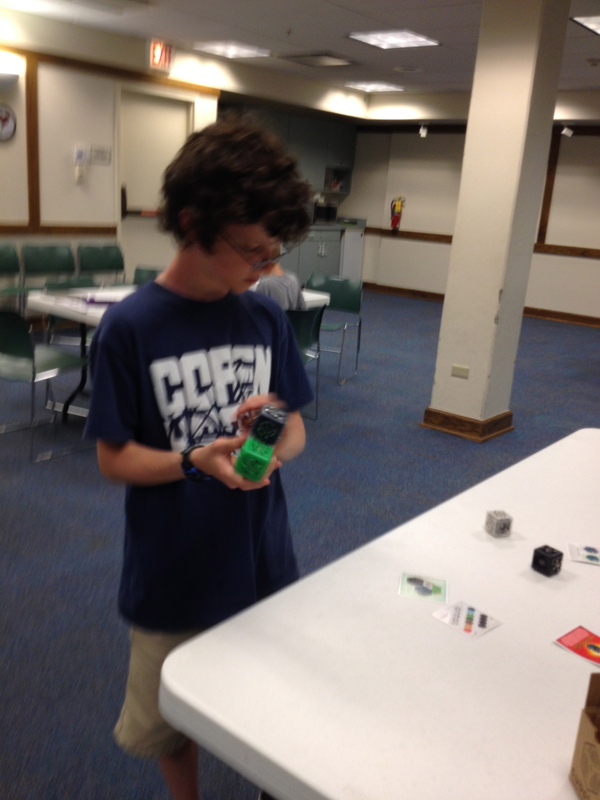 It was really great to see the teens get excited about the robots, and I am definitely encouraged to plan more in depth programs focusing on individual products, and after running my sample group through all of these, I have a much better sense of what will make for successful programs with each tool. More thorough descriptions and reviews of each of these products is forthcoming. Previous Previous post: True Confessions: Will anyone care?